This Is Framingham » Blog Archive » Cut it out! We had this problem too and tried all sorts of things. Putting cayenne pepper all over the digging spot among other things. Nothing humane seems to work. So, we eventually moved. Not because of the skunks but it DID work for us! I’m guessing my wife commented above me, since she sent me the link. Russell’s in Wayland (on Rte 20) should carry a product call MoleX (I think that is what it’s called – I can’t remeber exactly). You can spread that just like fertilizer. It has a strange smell, but you won’t notice it after a few days. Skunks don’t like it. And if you see that they are living under a deck (like in the photo), spread some at the netrance after dark, and that should keep them from going back in. That worked for us. Of course, there are more permenant/solid ways of keeping them out. In addition, skunks hate noise and water. Russell’s should also have an automatic sprinker (approx. $80) that is motion sensitve. That worked too. But you really need to get what they are going after too. This could be grubs or even beetles (these big fat crunchy ones that they we after in our yard). Short of the too thing above, you can call someone, but that’s expensive. Get a 5 or 6 gallon jug, like somethingv from a watercooler. Fill it with your own urine. (Hey, it’s gotta go somewhere.) Then add a cup of Listerine for health purposes, a few tablespoons of liquid laundry detergent for surfactant charateristics, a pouch of chewin’ terbacky for extra flavor, and then spray that stuff around especially after it rains. Guaranteed to keep everything away from your yard. YIKES!!!! How did I miss Steve Orr’s suggestion to put human urine in your yard??? We live in Florida and have armadillos tearing up our lawn looking for grubs. Crushed moth balls did repel them for a while. Milky Spore – get it at your garden center, and apply it twice, once this summer, and once next summer WITHOUT applying any other grub treatment. 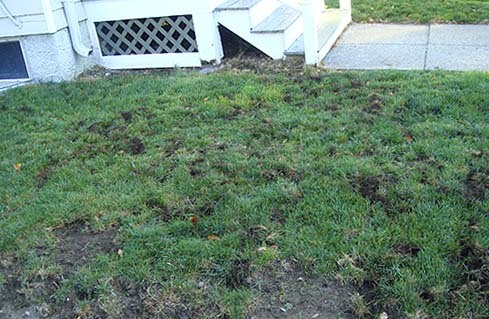 It will keep grubs out of your lawn for 10-20 years.